On Saturday, November 10 and Sunday, November 11, Driftwood Country Music, Craft Beer & BBQ Festival returns to Doheny State Beach in Dana Point, CA for its 3rd annual Veterans Day Weekend celebration. Presented by Go Country 105, this all ages event will feature music from some of today's top country acts including Chase Rice, Big & Rich, Michael Ray, Kristian Bush (of Sugarland), Carly Pearce, and more, plus tastings from a selection of over 200 craft beers, and top-notch BBQ from some of the region's best restaurants and food trucks. Produced by premier music festival production company Synergy Global Entertainment (SGE) and California's most successful and respected craft beer festival producer Brew Ha Ha Productions, Go Country 105 Presents Driftwood Country Music, Craft Beer & BBQ Festival offers a weekend of entertainment for the whole family. Driftwood will feature line dancing workshops, mechanical bull rides, oversized games including Beer Pong and Giant Jenga, lounge seating, photo ops, and much more. Festival attendees will be able to roam throughout the lush grass and sandy areas of Doheny State Beach, right off the shore of the Pacific Ocean. Chase Rice says, "There's nothing like a fall night out at a music festival. Last time we played the Driftwood festival out in Dana Point, the fans were incredible, and there to take it all in—not just the hits, they knew the album cuts. When we make music it's with moments like that in mind. We can't wait to see y'all again." Big & Rich adds, "Beaches, good weather and country music…California here we come. Get ready for a Big & Rich time." Driftwood kicks off at 1:00 PM each day (with early entry and VIP guests arriving at 12:00 PM). During VIP early entry tastings (from Noon-4:00 PM), and general admission tastings (from 1:00 PM-4:00 PM), craft beer lovers 21+ can choose from over 200 craft beers from dozens of top breweries. The initial list of participating breweries includes: Avery Brewing, Barley Forge, Bootlegger's, Burgeon Beer Co., The Wild Barrel, Alpine Brewing, Artifex, Chapman Crafted, and many more to be announced. A limited number of Single Day and Weekend VIP packages will also be available for purchase, including an "eat and greet" Backyard BBQ With Chase Rice. 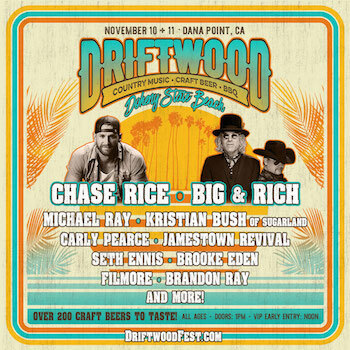 Driftwood VIP is presented by Head Down Eyes Up, Chase Rice's apparel brand and personal motto: "A way of life where you succeed not by looking at an end result, but by fighting every step of the way." A portion of the proceeds from Driftwood at Doheny State Beach will be donated to the Doheny State Beach Interpretive Association (DSBIA)—the non-profit cooperating association of Doheny State Beach, dedicated to the protection of the park's beaches, facilities, marine refuge and its historical, cultural and social stories—and the San Onofre Parks Foundation—a California non-profit that cooperatively works with the California State Parks to develop, preserve and enhance the recreation and experience of California's unique and beautiful coastal parks. Orange County, California based Synergy Global Entertainment, Inc. (SGE) is one of the world's premier music festival production companies. SGE events include music and lifestyle festivals across a variety of genres and interests, with over 70 major festival dates in 2018. SGE produces or co-produces Back To The Beach; Big Adventure; Driftwood; ID10T Music Festival + Comic Conival; Knotfest; Lost Lands (Your EDM Best Festival of 2017 and Noiseporn 2017 Festival Of The Year); Moonrise Festival; MUSINK; Ohana Dana Point; Sabroso Taco, Craft Beer & Music Festival; 92.3 WCOL Country Jam + Campout; Scallywag!, and more. In addition, SGE co-produced the Rockstar Energy Drink Mayhem Festival and the worldwide Rockstar Taste of Chaos, and created and produced the Identity Festival, Oddball Comedy and Curiosity Festival, and Rockstar Energy UPROAR Festival. This year's SGE-affiliated events are projected to sell nearly 1 million tickets overall. In addition to festival production, SGE's in-house sponsorship agency procures and executes a multitude of partnerships in varying forms for global brands, top-tier artists, international booking agencies and more. Brew Ha Ha Productions (BHPP) is one of the largest craft beer centric event producers in the United States. Fueled by a desire to promote craft beer, along with visions of creating unique annual events, Orange County based BHHP has enjoyed an unprecedented 180% growth in 2017. Established in 2010, BHHP's Award Winning and diverse events now reach beyond OC and California including festivals in Arizona, Washington, Oregon, Nevada, and Colorado. A 'For-Profit' organization whose missions includes giving back, BHHP has helped many non-profits raise awareness and money to further their worthy causes.